Worshipped for over three-fifths of recorded history, Egypt’s gods and goddesses are among the most fascinating of human civilization. The lives of pharaohs and commoners alike were dominated by the need to honor, worship, and pacify the huge pantheon of deities, from the benevolent to the malevolent. The richness and complexity of their mythology is reflected in countless tributes throughout Egypt, from lavish tomb paintings and imposing temple reliefs to humble household shrines. The Complete Gods and Goddesses of Ancient Egypt by Dr. Richard H. Wilkinson, Professor and Director of the University of Arizona Egyptian Expedition, is a handy and visually rich compendium of information on ancient Egyptian religion, mythology, and folklore from the dawn of the 'Age of the Pharaohs' until the Arab invasions in the 7th century CE. Comprehensive and authoritative, this title is indispensable to Egyptologists and lay audiences curious about the religious life of ancient Egyptians. Those already acquainted with the subject will recognize the comprehensive treatment Wilkinson provides and, for those new to ancient Egyptian religion, this volume provides an excellent introduction to the topic presented by an author who has written extensively on ancient Egyptian culture and history. Divided into five chapters - 'Rise and Fall of the Gods,' 'Nature of the Gods,' 'Worship of the Gods,' 'Kingship and the Gods,' and 'The Catalogue of Deities' - Wilkinson deftly explores and traces the rituals of worship as well as the development of religious iconography via series of a diverse subtopics in the first four chapters. However, the heart of this publication lies in the fifth and final section, which functions as an encyclopedia of deities, albeit in miniature. Here, the reader can find detailed information well-organized by the topic and by a deity’s name: 'Many Faces of the Divine,' 'Groups of Deities,' 'Male Anthropomorphic Deities,' 'Female Anthropomorphic Deities,' 'Mammalian Deities,' 'Avian Deities,' 'Reptile, Amphibian and Fish Deities,' 'Invertebrate and Insect Deities,' and 'Inanimate Deities.' Each venerated deity - I suspect that Wilkinson covers all in the known pantheon - is contextualized further through brief analyses of their place and role in mythology, religious and artistic iconography, and the manner in which they were worshipped. Using this approach enables any reader to locate any god in the Egyptian pantheon based upon their appearance. For example, if one only knew there was a female deity in ancient Egypt who presided over the written word, but did not know her name or appearance, one could simply look in the section `Female Anthropomorphic Deities' to find Seshat, the female scribe and patroness of librarians. Deities who are known by more than one name are listed by their best known as in the case of the goddess Qebhet, daughter of Anubis, who is more widely known by the name Kebehwet. Special note ought to be made of the over 338 illustrations, which evoke the power, mystery, and majesty of ancient Egyptian belief and spirituality throughout Wilkinson’s book. At only 256 pages in length, The Complete Gods and Goddesses of Ancient Egypt additionally contains fine sections on further reading with titles in English and German, sources for quotations, illustration credits, as well as an acknowledgement and index section. The chronology and map, located in the front of the book, are large in size and scope and thus quite useful too. There have been many excellent books written on this subject but what sets Wilkinson's apart is his command of the subject matter, the clarity of his prose, and the power of his interpretative skills in conveying to readers what these deities meant to an ancient Egyptian. The author brings all his knowledge of the culture to bear on the subject and thus provides a reader with a complete understanding of the subject at hand. Simply the two-page section on `Many Faces of the Divine' will prove itself invaluable to any reader interested in ancient Egyptian religion. Ancient History Encyclopedia (AHE) recommends this book to anyone interested or with a background in ancient Egypt, mythology, cultural studies, and theology. 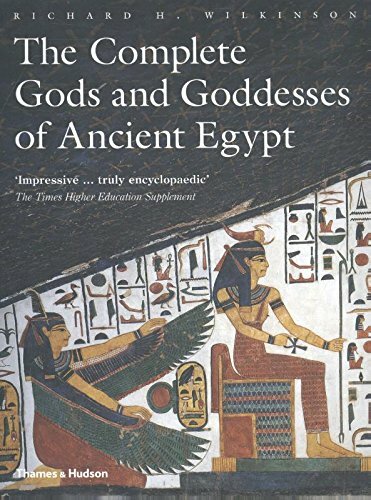 An exquisite and utilitarian reference, The Complete Gods and Goddesses of Ancient Egypt is perfectly suited for university studies in Egyptology courses as well. Wilkinson, Richard H. "The Complete Gods and Goddesses of Ancient Egypt." Ancient History Encyclopedia. Last modified September 01, 2017. https://www.ancient.eu/review/174/. Wilkinson, Richard H. "The Complete Gods and Goddesses of Ancient Egypt." Ancient History Encyclopedia. Ancient History Encyclopedia, 01 Sep 2017. Web. 23 Apr 2019.